The remediation of Leitchs Crossing with a nature-like rock-ramp fishway was undertaken in partnership between Moreton Bay Regional Council and Catchment Solutions. Leitchs Crossing is located in the lower reaches of the South Pine River and was ranked as the 11th highest priority fish barrier in the greater Brisbane region. A fish passage options assessment determined that a full width rock-ramp fishway was the best fish passage remediation option for this barrier type in assisting fish to ascend past the barrier to upstream habitats. Figure 1. Leitchs Crossing fish barrier prior to the remediation with a rock-ramp fishway. Following construction of the rock-ramp fishway at Leitchs Crossing, fishway monitoring was carried out in October 2017 to assess the capabilities of the fishway at passing the full suite of fish species and size classes expected to occur in South Pine River. The fishway trap was set at the exit of the fishway on the upstream side of the crossing, to show the numbers and species of fish that were able to ascend the fishway. Across five days of monitoring, a total of 19 species were surveyed ascending the fishway at an overall rate of 1,195.9 fish per day. Notable captures include juvenile freshwater mullet and speckled goby, both diadromous fish species that had not previously been recorded during annual EHMP fish surveys in the South Pine River (survey site located upstream of the former barrier). It is anticipated that improved connectivity as a result of the fishway will assist in the recovery of freshwater mullet and speckled goby populations in the South Pine River. Also significant was the high numbers of juvenile sea mullet; SEQ’s most important commercial inshore net fishery species, recorded at a catch rate of 209 fish per day. 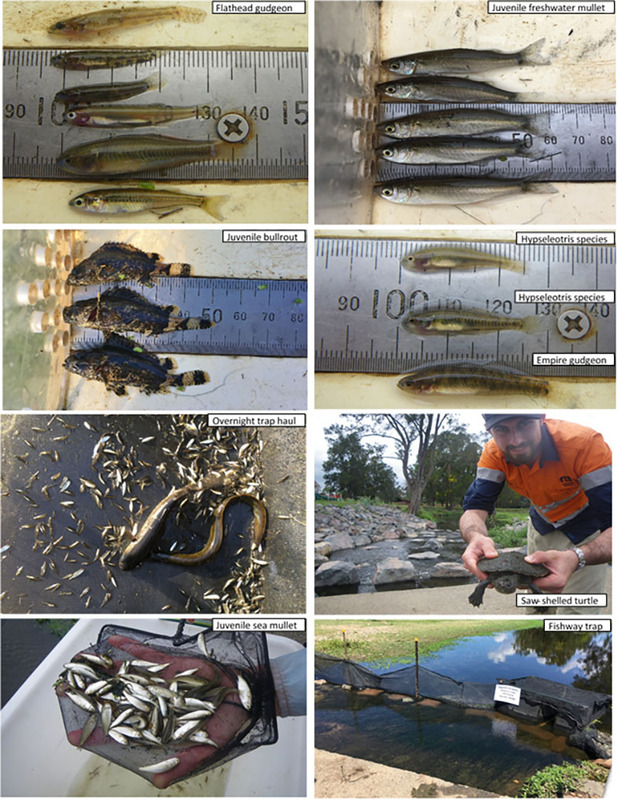 Similar to all fishway monitoring sites, no wild Australian bass were recorded, potentially suggesting poor and/or failed recruitment of this species. Table 1. Catch results of fishway monitoring of the Leitchs Crossing fishway in October 2017.